Clothing and culture are inextricably intertwined in South Asia. Dress reflects gender, ethnicity, religion, occupation, social status, and wealth in addition to individual taste. Because of the subcontinent’s size and the artistic richness of its cultures, what people wear is tremendously varied, visually engaging, and meaningful. 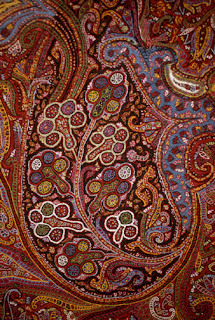 The Helen Louise Allen Textile Collection at the University of Wisconsin-Madison is especially strong in ethnographic material from South Asia. This exhibition showcases some of the HLATC’s best and most unusual examples of textile art for the body from India and Pakistan. While it is by no means a comprehensive survey—an impossible undertaking—it does attempt to convey something of the extraordinary masala (spice mixture) of South Asian clothing as an expression of the lives of the people who make it and wear it. There has always been a fertile exchange of reciprocal influences between Hindu and Muslim dress in both technique and style. The most obvious example of this is that many Muslim women wear saris and many Hindu women wear salwar kameez (pants and tunic). Parallel cross-pollinations occur between mainstream South Asian dress and tribal apparel, as well as between urban chic and rural folkwear. Alongside these dynamic networks of exchange, however, there remain distinctive and vibrant traditions that preserve cultural identity relatively intact in more isolated parts of the subcontinent. “Clothing and Culture in South Asia” celebrates this complexity and the artistry of those who created these body-coverings.